It was a nail-biting moment for many as they waited for President Donald Trump to announce his position on “certifying” the nuclear agreement between major Western powers (plus Russia and China) and Iran; officially known as the Joint Comprehensive Plan of Action (JCPOA). Although many leaks and announcements about Trump’s position proved to be true, it was so important that it drew immediate responses. In the Middle East, the region most directly concerned about Iran’s nuclear plans, contrast in reactions could not have been greater. While Iranian President Hassan Rouhani angrily condemned Trump’s position widespread applause came from Arab countries disadvantaged not only by Iran’s nuclear ambitions, but also its political exploitation of the international community’s silence towards it. It is the silence that has allowed Iran to conquer and expand in the Region, thanks to its militias and conventional weapons. 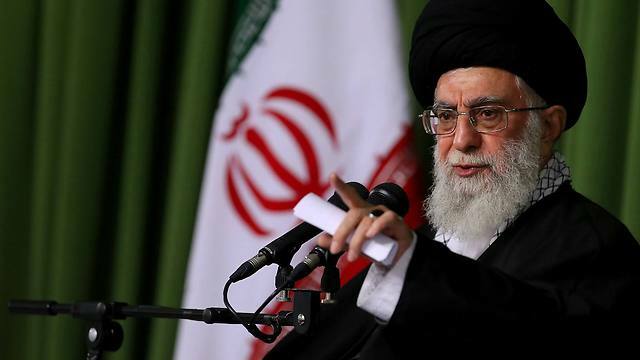 Indeed, in the Middle East, specifically in the Gulf area, there are two serious threats posed by Iran’s ambitions for hegemony, including the nuclear agreement. The first is political, the second is nuclear. The political threat is for all to see in the armed sectarian agitation, aided and sponsored by Tehran, whether through geographically dominant militias such as the Popular Mobilization Forces (PMF) in Iraq, ‘Fatemiyyoun’, ‘Zaynabiyyoun’ and Hezbollah militias in Syria and Lebanon, and the Houthis in Yemen; or through gangs involved in terrorism and clandestine activities as the ones we hear about in Bahrain, other Gulf states, and North African countries. Sure enough, the Islamic Revolutionary Guards Corps (IRGC), which plays a vital role in Iran’s political, security and economic life, continuously highlights its interventions and has openly boasted its ‘control of four Arab capitals’. Moreover, Qassem Suleimani, the Commander of the ‘Quds Brigade’ of the IRGC, never misses an opportunity to appear inspecting the front lines in Iraq and Syria, although he is supposed to be ‘wanted’ and chased by the international community as a terrorist suspect! As for the nuclear threat, it is no less dangerous from a purely scientific viewpoint. It has a geological-seismic dimension that has adverse consequences on the safety of the Gulf region; given the fact that Iran straddles highly unstable, and thus, dangerous seismic faults. Furthermore, many Iranian nuclear reactors and installations have been built in vulnerable earthquake fault lines; and if we remember that only a short distance separates the port of Bushehr (home to one the major installations) and the eastern shores of the Arabian Peninsula, we may imagine what disaster may befall the whole region from any leakage like that we witnessed in Fukushima, Japan, in 2011. Of course, the governments of Germany, France and the UK have every right to oppose or agree with Washington’s policies, but their insistence on defending the nuclear deal with Iran is based, in a large part, on economic interests. These governments, spurred by German, French and British companies and banks eager to enter Iran’s market of 90 million customers, refuse to acknowledge the link between the agreement and Iran’s harsh treatment of opposition at home, or its aggressive interventions in neighbouring Arab countries. 1- The refugee problem afflicting the countries of Western and Central Europe. 2- The problem of extremist terrorism under ‘Sunni’ Muslim slogans, provoked by Iran’s ‘Shi’ite’ Muslim slogans. According to reliable statistics, Iran’s exports to EU countries have risen by % 375 between 2016 and 2017, European companies have invested heavily in the almost ‘virgin’ Iranian market, and there is rapid progress in banking facilities that is running parallel with these investments. Thus, the three European governments’ positions look no different from that of Barack Obama’s administration which sponsored Tehran’s rehabilitation, accorded it all kinds of excuses, and gambled on making it a regional ally. They, just like the former US Democratic administration did before, are intentionally separating between nuclear technology and political repercussions. The three governments have ignored the fact that Iran’s lies second the World (after China) in the number of executions and first relative to population; and that many of these are of a political nature, mostly targeting ethnic and sectarian minorities. Furthermore, the three governments, while claiming to defend human rights, have done nothing with regard to Tehran’s maltreatment of figures that were part of its regime’s elite like ex-premier Mir-Hossein Mousavi, and former Speaker Mehdi Karroubi, not to mention the first president of ‘The Islamic Republic’ Abolhassan Banisadr, still living in exile in France! Berlin, Paris and London, which are repeating Obama’s same excuses that limit Muslim terror to Sunnis, refuse to admit Tehran’s active role in aiding and abetting even extremist Sunni Muslim groups worldwide, and co-operating with them, including Al Qaeda. The three governments want us to accept former US Secretary of State John Kerry’s inverted logic when he stated, time and time again during the US-Iran nuclear negotiations, that they solely touched on the nuclear side and never included any “other issues”. It is the same “logic” that Kerry reiterated this week as he criticized President Trump’s refusal to “certificate” the JCPOA while taking a tough line too against the IRGC and its appendages after highlighting their destructive role regionally and globally. As for the “other issues” mentioned by Mr Kerry, and ignored then by the Obama administration, were Iran’s political, military and intelligence interventions in Arab countries. Finally, the three European governments which have always claimed the moral high ground in welcoming refugees from the Middle East, could do better by adopting the maxim “An ounce of prevention is worth a pound of cure”. The ounce of prevention in this case, is simply, ridding the World of the evils of extremism, destruction and hatred, all of which create and fuel terrorism. Eyad Abu Shakra is the managing editor of Asharq Al-Awsat. He has been with the newspaper since 1978.